Awww, yeah. Momma finally got some new nightstands. As y'all know, I've been on the hunt for some new nightstands for our master bedroom. For the last three years, we've been using these little blue guys and, while I love them, they just aren't doing the trick functionally. I've been searching high and low for awhile now and along the way, I've found some great thrifted pieces that I could make over. But nothing has really screamed out "I'm the one!" Yes, I clearly have high expectations of my nightstands... they must talk to me. Finally, Pinterest got the best of me and I decided to join the rest of the world by attempting some Ikea Rast hacks. For $35 a pop for the dressers, plus paint and hardware, I can make over two solid wood nightstands for under $100... yeah, I'd say it's worth a shot. 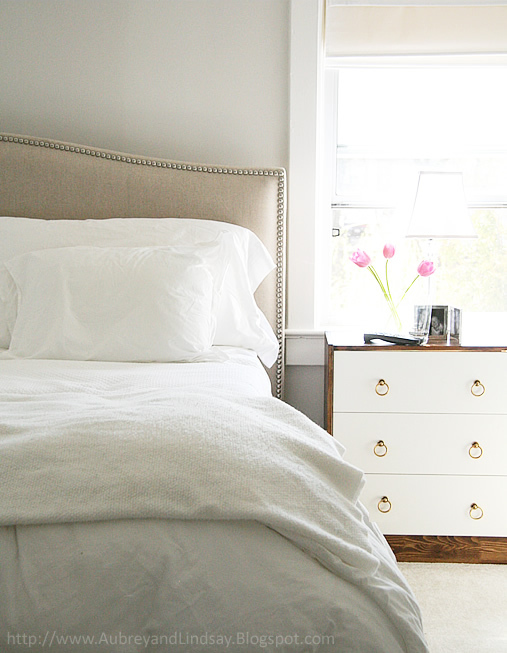 The nightstands are up already and we are loving them so far. I mean, our previous nightstands held, like, a cup. Now I can put all kinds of mommy things (burp cloths, pacis, video monitor, etc.) up on the Rast and still have room for my gossip mags. Boo yah. But here's the question now... what color should I paint these little beauties? Since we're in a rental house and would like to redo our master bedroom one we're in a permanent house, I think something neutral is the way to go. We could eventually repaint them something bright and colorful once we decided on a more permanent bedroom scheme. There's the obvious blogger favorite- stain + white. 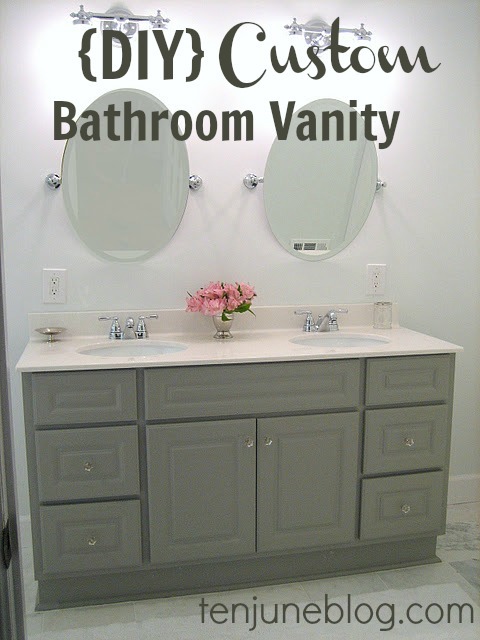 I've also thought about recreating our DIY master bathroom vanity from the old house with the Cement Gray paint and glass knobs. I love this plain white version, but I'm not sure we're up for adding all of the trim like they did. I'm also contemplating a possible stain + paint patterned finish. Or maybe I should just stick with all white and dress it up with some fun knobs? So many options! What's your vote? Any suggestions?! I decided we'll be buying these nightstands this weekend too! Nightstands are way too expensive, and I'm just not willing to spend that kind of money. I can't wait to see what you do with them! I'm a big fan of the all white with wood stained top. Add some fun knobs and you're all set! And like you said, you can always repaint once you move. Best of luck! I've had a Rast in its box in my garage for a year now because I can't decide what to do! I finally bought hardward, great square brass pulls. I'm leaning towards the green paint treatment a la Kristin at the Hunted Interior, but also love the white and stained wood look...can't wait to see what you do! Awesome!! 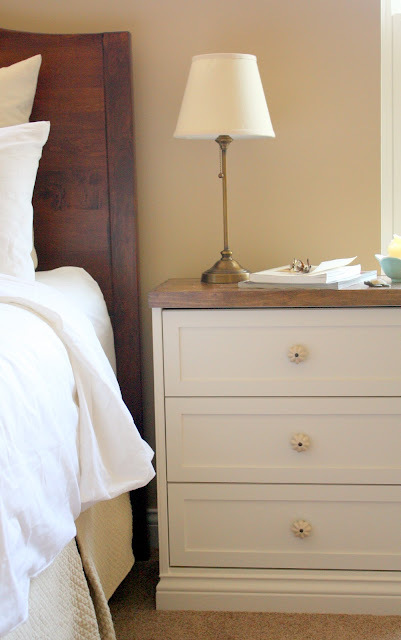 I love and have loved the nightstand from aubrey and lindsay blogspot! i have these in my garage, waiting for my hardware to show up. (it's been a nightmare.) i'm doing a campaign style, white with gold hardware. can't wait to see what you do with yours! It was my first staining project, and I didn't do it exactly right, so I have some streaking, likely from going against the grain (which I swear I didn't mean to do, but obviously I did). But it's only really noticeable to me. The tops need a ton of varnishing, though. I used a low VOC option which was great since I was doing them in a small enclosed spaced, but man, I had to do SO MANY coats! And I feel like they could use a fresh coat now, after being used for a few months. I like the stain + paint combo, but am thinking the all white with fun knobs would be awesome. Yay for Ikea!! I love the white with the dark stained top! Neutral, but there's a little bit of contrast. I bought a rast a year ago for my 5 year old nephew's dresser. We used magnetic primer and chocolate chalkboard paint as a fun activity dresser in his room. We use the 2x2 expedit from IKEA as our master bedroom night stands. So many options! I like the stain/paint combo in the first pick! Can't wait to see what you decide to do! I like the stain/paint option. Seems like something fun to try and more of a challenge. I think you should go with a color and some awesome coordinating knobs/pulls. 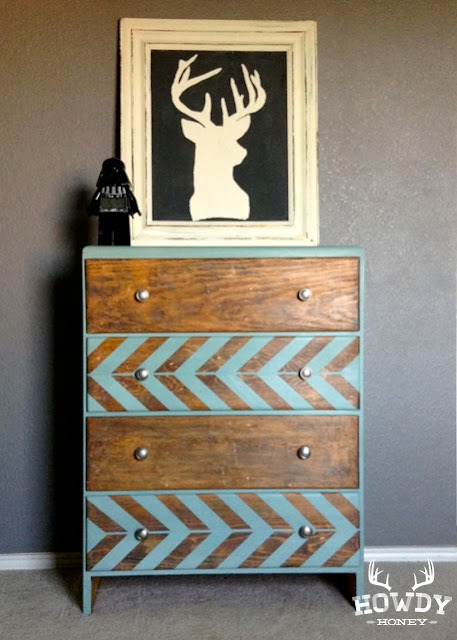 Or instead of going white and stain, paint the drawer fronts white & the surround blue? Maybe a stripe across each drawer? Stain and white is super cute. But I'm also a sucker for plain white or dove gray with a colorful and/or glass knob! i vote for white with fun knobs! If you want to paint it a brighter color once you redo the master bedroom you'll definitely have the option to!